Wine-loving travelers eager to sample the bounty of Napa Valley's vineyards don't necessarily think of Downtown Napa as a prime tasting destination. But in fact, the area has more wine tasting opportunities "than any other place in the world," the Napa Downtown Association boasts. There are lots of great spots for sipping — from true wine bars and lounges to tasting rooms, wineries and so-called collectives — all located within a short walking distance of one another. 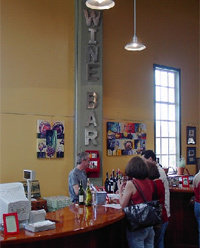 The bars and tasting rooms have an advantage over wineries: they can offer many different labels from around the world in one location. "Wine Collectives" are a series of small, bonded wineries legally tied together to present, taste and sell their wines to the public. These collectives give smaller, boutique wineries a presence where otherwise they would have to try to operate their own (expensive) tasting rooms on their own. Bounty Hunter has been a popular catalog merchant of specialty wines from around the world for more than a decade. Things got even better in 2004, when owner Mark Pope opened his retail shop in the handsome 1888 Semorile Building, in the heart of "happening" Napa. Bounty Hunter is an ambitious wine enterprise, showcasing forty wines by the glass and more than four hundred in the bottle. Premium, craft and hard-to-find wines are available in abundance, but many excellent recognizable labels can be found as well (and if a favorite's not in stock, BH's "Wine Scouts" will do their best to track it down for you). The setting is charmingly rustic Western; bar patrons can sit on vintage saddles from 11 a.m. to 10 p.m. on weekdays, and 11 a.m. to midnight on weekends. The bistro menu ranges from a charcuterie plate to the Bounty Hunter Smokin' BBQ Platter. 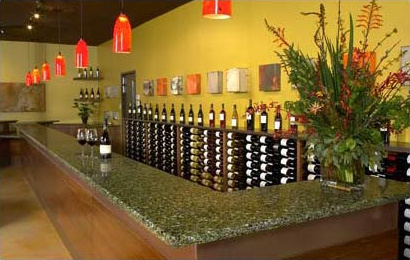 This shop is a must for all wine loving visitors wanting the true, new Napa experience. This eclectic store is part of the refurbished Napa Mill mall, which dates to 1884 and is located at the base of Main Street. Besides selling artisan wine country culinary knickknacks, locally produced gourmet items, and offering a satisfying casual, eclectic menu, "The General" has an enjoyable, reasonably priced wine tasting bar offering a variety of California wines. The riverside tasting bar specializes in wine from small producers — many of just a few hundred cases a year — and bottles are available for shipping (in mixed cases, if desired). Visitors can actually find real bargains here. The outdoor patio overlooking the Napa River is a plus. A swanky new wine bar in Downtown Napa, 1313 Main offers over 1,300 rotating labels of fine wines offered by the taste, glass, flight or bottle, complemented by small plates from local artisans: charcuterie, cheeses, savory sides and sweets. A revolving list of thirteen craft beers is also featured. Special events include new release tastings, private vintner tastings and Cru 32 club activities.